ABB is supplying a complete power and automation solution for a groundbreaking bioconversion technology that processes municipal waste into high-grade compost and generates emissions-free electric power from waste biogas. Perth, Australia, November 5, 2008 - Designed and engineered by Australian company AnaeCo, the first installation of this patented technology known as DiCOM® is currently under construction at a municipal waste transfer station in Shenton Park, a suburb of Perth, Australia's fourth largest city. A waste transfer station is a facility where municipal solid waste is unloaded from collection vehicles and briefly held before it is reloaded onto larger long-distance vehicles for transport to landfills or other treatment or disposal facilities. DiCOM is an automated bioconversion process that converts municipal waste into high quality compost which would otherwise be incinerated or transported to a landfill. The biogas produced during the process is used to generate renewable emissions-free electricity to power the facility. Surplus electricity - enough to meet the annual needs of several thousand Australian homes - is sold to the grid. In developing this first installation AnaeCo required a partner who could provide a complete and integrated solution that would both power and automate the entire bioconversion process. AnaeCo selected ABB's award-winning Extended Automation System 800xA as the process automation integration foundation for the project. "We selected ABB as the preferred automation provider because of its state-of-the-art integrated solution and its excellent price-performance ratio," says Thomas Rudas, AnaeCo's managing director and the inventor of the DiCOM process. ABB's extensive scope of supply includes a process control system based on System 800xA, field instrumentation and gas analyzers for safe and hazardous areas integrated with System 800xA through Profibus, variable speed drives also integrated with System 800xA through Profibus. It also includes electrical equipment to power the process and export the surplus energy to the local power grid. The DiCOM system offers the waste treatment industry considerable benefits. The system is compact, modular, sealed and does not emit odor - a key factor in sensitive urban environments where waste transfer stations are often located. Non-organic material is rapidly sorted from each batch prior to the conversion of the remaining organic waste into compost and biogas. For the end customer, Western Metropolitan Regional Council, DiCOM is transforming a simple waste transfer station into an integrated waste recovery and bioconversion facility. Waste that was previously transported 40 kilometers through residential areas to a landfill in a three-hour return journey is now processed cleanly and profitably onsite. 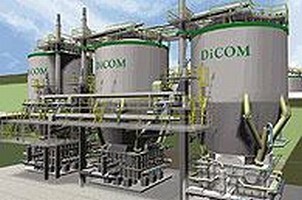 DiCOM is attracting widespread interest from municipal waste facilities all over the world, with several additional orders from Australia and Europe already in the pipeline. ABB (www.abb.com) is a leader in power and automation technologies that enable utility and industry customers to improve performance while lowering environmental impact. The ABB Group of companies operates in around 100 countries and employs about 120,000 people.